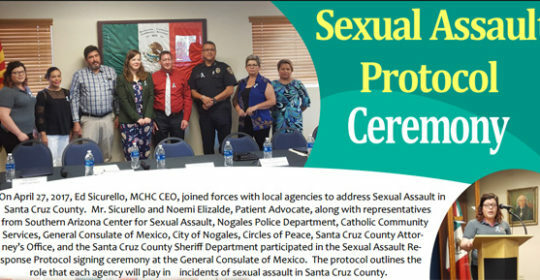 On April 27, 2017, Ed Sicurello, MCHC CEO, joined forces with local agencies to address Sexual Assault in Santa Cruz County. Mr. Sicurello and Noemi Elizalde, Patient Advocate, along with representatives from Southern Arizona Center for Sexual Assault, Nogales Police Department, Catholic Community Services, General Consulate of Mexico, City of Nogales, Circles of Peace, Santa Cruz County Attorney’s Office, and the Santa Cruz County Sheriff Department participated in the Sexual Assault Response Protocol signing ceremony at the General Consulate of Mexico. The Protocol outlines the role that each agency will play in incidents of sexual assault in Santa Cruz County.